I’d never given Lent much thought until I got married. My new husband, who had grown up in a deeply Catholic culture, suddenly decided to quit drinking sodas and not eat any meat on Fridays. I didn’t even realize it was Lent and hadn’t considered giving up anything. Lent wasn’t a big tradition for my family, although I always had some friends who chose things to give up for Lent. My husband introduced a new twist of not eating meat on Fridays, which was fine since we loved Friday date nights at our local sushi restaurant. It left me wondering, though, what Lent was all about? Why were we really giving up these foods? What spiritual purpose did this serve? How did giving up chocolate and eating more fish bring me closer to God? Lent is a season of penitence and repentance leading up to Easter. A season where we recommit our lives to God and turn from the distractions, bad habits, and sins we’ve accumulated throughout the year and purposefully commit to moving closer to God. The season of Lent is 40 days (from Ash Wednesday to Easter, not including the Sundays) as a parallel to the 40 days Jesus spent in the wilderness. I’ve also read that it’s about 10% of the year, so like a tithe of our time to refocus on our relationship with God. Lent is a great time to evaluate the current state of your relationship with God. What has come between you over the year? What do you need to change or give up in order to give him your focus? Are you giving God the “first fruits” (the best) of everything in your life – your money, time, and focus – or is there an area that needs attention? Traditionally Lent is observed through prayer, fasting, and giving. You may also choose to take up another spiritual practice, such as adding a daily devotional or participating in a daily prayer service, in order to bring more focus to your relationship with God during this time. Observing Lent is more than simply giving up chocolate for 40 days (unless chocolate is the thing that’s come between you and God). Lent is intended to be a time of giving up something that hinders your faith, and instead devoting that time, money, or focus on rebuilding your relationship with God. So, how will you observe Lent this year? Prayerfully ask God how he wants you to observe Lent. One year, he asked me to give up an hour of sleep to wake early and spend time with Him. Another year, he asked me to give up praying for myself and instead focus my prayers only on others. He even asked me to quit doing laundry on Sundays one year and instead focus on observing Sabbath. What I found was these were areas I where I needed to refocus – and doing them for 40 days helped create new habits in my life. Join our 'Prayers and Possibilities' newsletter for weekly encouragement and I'll send you "15 Meaningful Things to Give Up for Lent (besides chocolate)" as a FREE gift. Giving up chocolate (or sodas or coffee) isn’t a bad idea, but give some thought into how that sacrifice will bring you closer to God through Lent. Will you save the money you would have spent and donate it? Will you say a prayer each time you’re tempted to eat chocolate? Do you need to break a dependence on sugar so that you can give God your best? Do you love to stop by Starbucks (or another local coffee shop) in the mornings? What if you gave that up for Lent – and instead put the money you’d have spent on coffee toward fresh water wells in a developing country? Not sure you can take on a big fast? Try a mini-fast. Skip breakfast or lunch once or twice a week. Don’t just fill that time with more work, though. Spend that time in prayer or reading your Bible. Do you spend a lot of time on social media? Constantly checking the latest updates on Facebook or Instagram? Give that up for Lent. Delete the app from your phone, so you’re not as tempted. Instead of checking your feed each morning, spend 10 minutes each day keeping a gratitude journal. 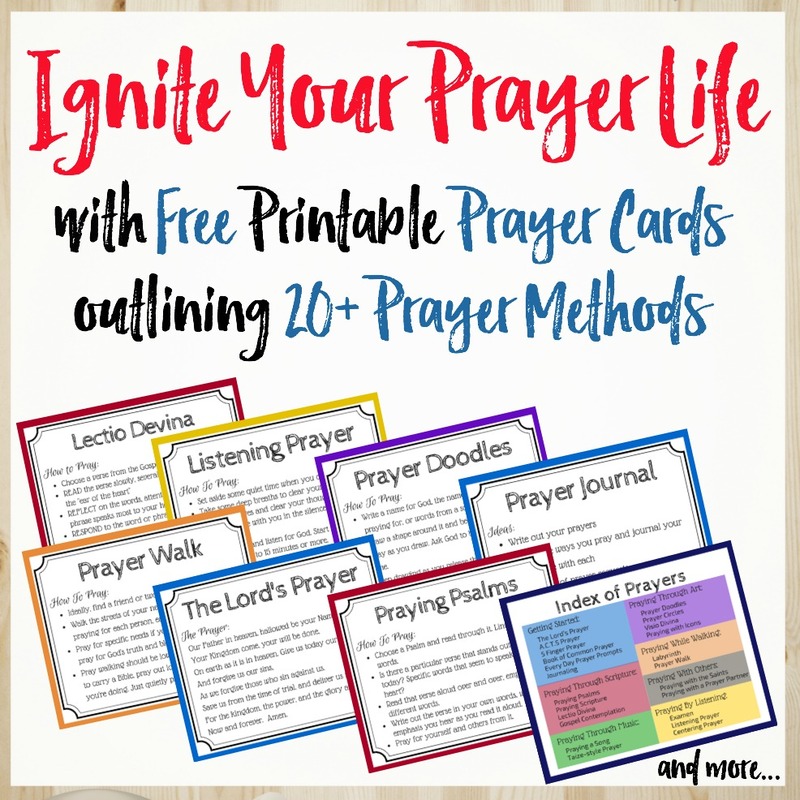 Feel stretched for time for prayer and Bible study? For the season of Lent, commit to waking up at least 30 minutes earlier. Set your alarm, brew a cup of coffee, and spent that extra 30 minutes with God before the rest of your house is up. Consider a daily devotional to guide your time of study and prayer. How do you spend your weekend? Do you find yourself binge-watching Netflix on Saturday? Try giving up TV on Saturdays (or all weekend) and instead spend that time volunteering. Check if the local food pantry, clothing resale, or Habitat for Humanity chapter have workdays you can join. Do you spend a lot of your day in the car driving to and from work, or shuttling kids from one activity to the next? Turn off the car radio and spend that time in prayer or listening to the audio Bible. Each time you’re tempted to spend money on something that isn’t a true NEED, say no. Instead, set aside the amount you would have spent. At the end of Lent, donate the money you’ve saved. Do you find yourself losing your temper and yelling – to your kids, to your spouse, to others? Make a practice to be intentional about giving up yelling for Lent. Ask those close to you to be your accountability partners. Each time you feel yourself start to yell, be intentional about quieting your voice and saying only kind words. Do you love to kick back after work and watch a favorite TV show (or 3 or 4)? Or, maybe your TV is always on watching the news or sporting events? Give up those weekday TV shows and instead spend that time digging into a Bible study or devotional. Has anger or resentment made a home in your heart? Lent is a great time to send them packing! Spend the 40 days of Lent in prayer to forgive and let go of the anger and resentment. Dig deep with God over the sources and ask his help to heal your heart. Don’t think you can give up social media altogether? Then make it a more intentional and prayerful experience. Instead of mindlessly scrolling through your feed, pause over each post and picture to pray over the person or headline you see. Where you find comfort on the hard days? Do you reach for the ice cream, cookies, or fried food? Give up these comfort foods and instead look for comfort in God alone. Seek God through prayer and scripture. Have you been in a season of focusing on yourself and your needs? Maybe your prayers have been centered on a need in your life or you’ve slipped into a self-focused season? Give up focusing on yourself for Lent, and be intentional about devoting your time and prayers to others. Stay up a little bit later or cut out 20 minutes of some other evening activity to spend time in prayer before bed. Commit to the spiritual practice of the Examen prayer, a daily debrief with God to review your day. Are you afraid to pray aloud? Give up the thing that’s holding you back – pride, fear, embarrassment. Seek out opportunities to pray aloud with others, both friends and strangers. Want a free printable of these ideas for Lent? How Might 40 Days Change Your Life? 40 days might just be the season you need to renew and refocus your heart! Taking on a discipline – giving something up or add something in – will retrain your heart and lead you toward new, improved habits and perhaps a stronger relationship with God. So, what will you give up – or take on – this Lent? Will you give up that daily Starbucks and put the money instead toward something – or will you give up some of your sleep to spend time with God each day? Pray and ask God to show you how he wants you to spend these 40 days. Ask what you need to remove from your life or what step you need to take to draw nearer to God. Not sure? Why don’t you take a step to draw nearer to God through prayer? Step into a 40-day prayer devotional and discover the power of prayer. Power up your prayers and deepen your relationship with God through 40 days of intentional scripture-based prayer in the Power Up Your Prayers course. > Learn to pray with more power and purpose. To close your Lenten season, I highly recommend walking with Jesus through Holy Week. Make the most of this season by fully stepping into the story and experiencing the full emotion and drama of Jesus’ final week on earth. Click here for 10 Holy Week Activities to make your Easter more joyful and meaningful. So, how will you observe Lent this year and use these 40 days to develop new (or improved) spiritual habits and deepen your relationship with God? Thanks, Liz! I struggled with all the rules I’d heard about Lent, but love the opportunity and reminder to double-down on a spiritual practice and focus on faith-building. Wishing you all the best this Lent season! Sarah – Lent has been a fairly new practice for me, too, but one I’ve come to really appreciate. I find it particularly meaningful and impactful when I take time to listen to where God’s leading and take on a discipline that draws me nearer to him. Hope you’ll be inspired to try something this Lent! I liked the title as well and it drew me in. Thanks for your thoughtfulness on this. It has given me some inspiration to consider during Lent. Lord willing, I intend to give up playing games on my computer. Patricia – I’m glad you were intrigued by this post! Hope you’ll consider where God wants you to focus this season. What will you give up in order to give him more? This is so good, Kathryn. I will be sharing this. Thanks for helping me to think ahead. I like the idea of using Lent as an opportunity to focus on my relationship with God and seek to draw near. Maybe I will recommit to scripture memory and pray my verses over family and friends. Thank you for sharing this, Betsy! I really have come to love this time of year and listening for God’s direction on how he wants me to focus each year. It’s always something significant and always grows my faith. Enjoying these ideas. Taking time to refocus and dedicate ourselves anew is a wonderful way to prepare for Easter. Thanks, Ginger! I’ve enjoyed connecting to this Lenten season over the past several years and find it’s such a great opportunity to dig deeper with God. I just wanted you to know that I shared this post on my site! Here’s the link if you want to see it! Such good ideas. Thanks for sharing this post! Loved yours and shared it out to my networks. Have a blessed Lent season!